OC Prudent Bear: Are Your Bank Assets at Risk? 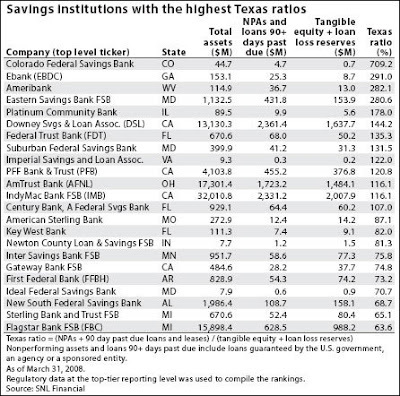 Regulators learned in the 1990s that the higher a bank's Texas Ratio the more likely it is to fail. 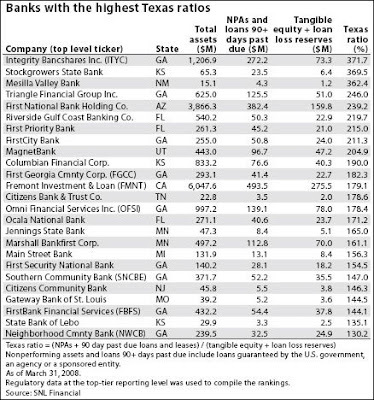 Is your bank on this list? If it is, move your money. And call mom and dad to be sure that they don't have any money in these insitutions either. Using this ratio, regulator say as many as 150 financially strapped institutions could fall over the next 18 months. You do NOT want to be one of the "statistics" in this fallout. Thanks for providing great information i will withdraw my all money from these institutions. Your post is very good, you done a great work, you work for all those people who have all of their life income in these institutions. your study is very good, your work is all those human beings who trust such institutions so thanks for great information.